One of the most common questions we’re asked is “How can Habitat afford to build houses for folks who can’t get housing on the for-profit market?” Well, maybe not in those exact words, but we’ve heard hundreds of variations on the theme. The answer is kind of complicated, but the principles behind our business model are actually fairly simple. It’s all about partnership and mutual benefit that creates a sustainable virtuous cycle. The process starts with community investment — from grants, housing assistance programs, foundations, donations from businesses and individuals, and the work of the Habitat staff. Homeowners and renters then repay that investment through cost-manageable leases and loans. Donations to our ReStores are re-purposed, while the proceeds from sales contribute even more to the general fund. Meanwhile, Habitat spending on construction, renovation, and overhead flows into the local community, and increased financial stability for residents generates more local spending while removing blight and reducing the need for public assistance. The result is a more prosperous community for everyone! 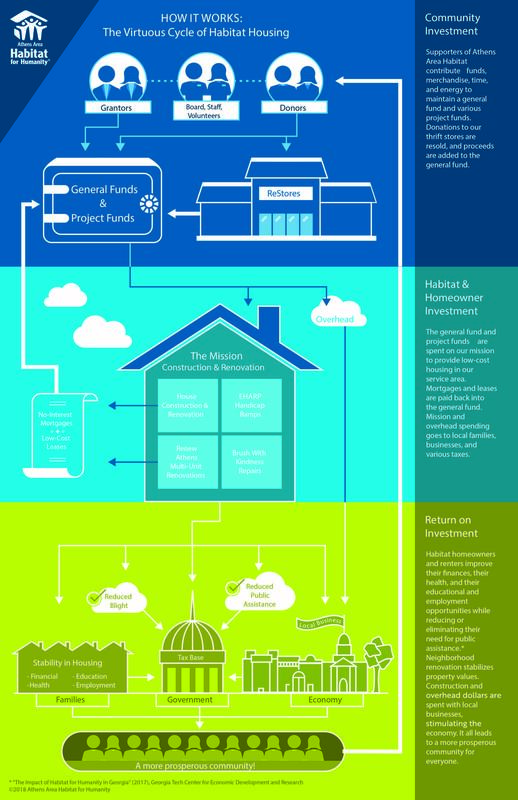 If you’re not sure what all that means or how it fits together, take a look at this handy infographic, which shows just how investments in Habitat come back to benefit not only those who need housing, but also the donors themselves and everyone in the area we serve!